recently i posted a picture of our dawson kids promotion packages on instagram and i had several people ask me what was inside them. so, i thought i would share the contents of our promotion mailout on here. i would love to know what you guys send out to inform and get kids excited about the new year. 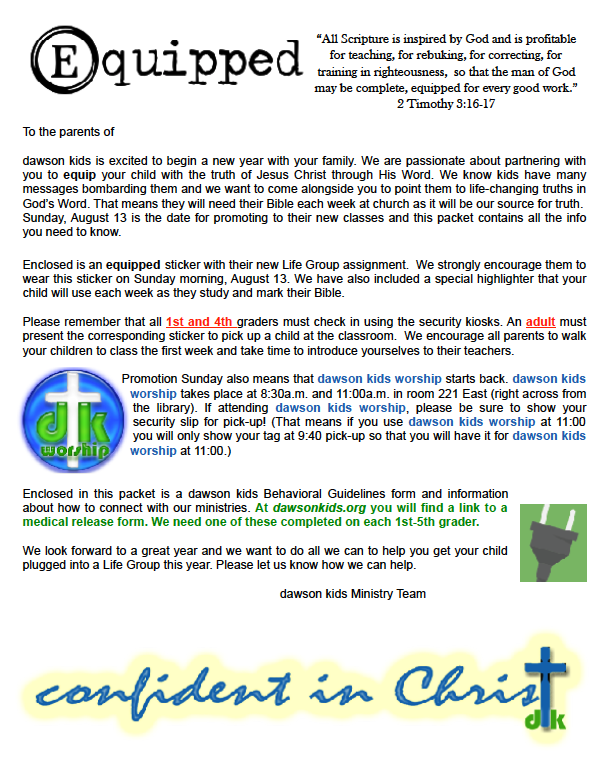 first up is a promotion letter explaining our theme for the year and details parents need to know about promotion sunday morning. there is nothing earth shattering or life-changing in this letter, but you can view it here. especially, because we have many new 1st grade families moving up, we want them to be familiar with our dk staff and how to reach us, so we include a sheet with staff pictures and contact information. another important element in this promotion package is the behavioral guidelines. these are guidelines we require all children to follow so that we can provide the safest and most effective ministry environment. you can view it here. we use to include our medical release form, but we have moved that to our website. also included is a connect card so families know where to find us on social media and the web. then, each child gets a sticker that has their assigned class (in the class color) on it so they can wear it on promotion sunday and match it to the balloons in their new room. and lastly, we have a giveaway that goes with our theme of the year. during the 2017-2018 we are going to focus on equipping kids with God’s Word so they can be confident in Christ. (i’ll blog more about our equipped theme later.) this year, each child will receive a five color highlighter that we are encouraging them to bring it to church each week. as we dig into God’s Word together, we are going to have them highlight and write truths in their Bibles, highlight the Gospel God’s Plan for me, and more. if we are going to successfully equip them to be disciples in this world, we have to be intentional about training them in the truth of God’s Word. okay, i shared, now i want to hear what you mail out for the new year.